Earn $2.31 in Rewards credit (231 points) What's This? Hit the streets on your MTB with Michelin's Wild Run'R slick tire. 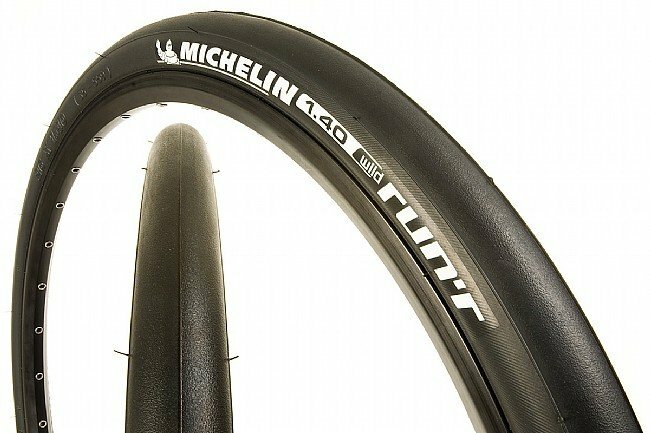 Ideal for recreational road rides or commuting with a rubber compound derived from Michelin's top of the line road racing tires. This 26 x 1.4" version emphasizes comfort with its large air volume. Fits on a standard 26" mountain bike rim. The Wild Run'R features a 33 TPI casing and is available in 26 x 1.40 Inch (35-559 ISO). 87 max PSI. Wire bead. All Black. 420g. runs smooth and quiet and does not set the dogs off. This is the best city/road tire of several I've tried. The tires are supple and fast rolling, a different feel altogether from priors. The tires were difficult to mount on my Bonti rims because of the stiff beads. I can't comment on the wear. I'd definitely get these again. Actually pretty good for what I paid. If you were to go to Walmart for some no name MTB tires you'll spend the same as you would for these Michelin brand. There are pretty fast and I thing they look pretty cool. They made me like my MTB that much more again for the same price I would have spent one a lesser name brand tire. I took a 1995 cast-off Trek Singletrack and use it as a back-up commuter bike - it works much better with tires like these than with knobby wider tires - slicks give plenty of traction on asphalt and concrete. It was not obvious which tubes to order with these since these are nominally 1.4 inch and the smallest mountain 26 inch tubes were 1.5-1.75, but when I asked I was told that size would work fine. Since the tubes are relatively big for the space, some care is necessary to insure the tube doesn't end up between the rim and tire when you install, but that is easy enough to watch out for. The tire has a wire bead but it is easy to install on a mountain bike rim. The bike I put these on had the 1995 original rims which are probably about 14 more narrow than typical mountain rims I see on current bikes, but the tires seem well seated once installed. The max pressure is given as 87 ppi which seems an amusing number - not 90? or 85? but anyway, I can't imagine why anyone would want to turn them that hard. I have run them at around 65 and that seems fine. Have been riding an old Trek 4300 to and from work. Had some pretty knobby tires that were starting to wear down the center. Picked these up with some new tubes. Much less rolling resistance, smooth ride. Hologram they hold up, so far no flats. Bought these for my converted mtb to grocery getter. Excellent roll resistance on these for loaded trips from store. Thick contact patch and at recommended 86psi lots of traction and fast,Plus they look awesome. Ive converted an older mountain bike to a bike trail family bike that I pull a trailer with. These tires intrigued me so i thought I'd give them a try. Only have about 100 milea on them but love the ride quality and speed vs a mountain bike or commuter tire! Would buy again as they seem to wear and feel as good as the Michelins i run on my road bike. These are great commuter tires. I put these tires on an older Specialized Stump Jumper that I use for commuting. They run well and are very quiet but most importantly, they have improved my commute time significantly. The high pressure (87 psi) and low rolling resistance make them perfect for city commuting. Love these. Upgraded from 2.5 hybrids and gained speed and efficiency and great traction wet or dry. I have a 26 BMX PK Ripper that I ride around the neighborhood for exercise 90% of the time on the street. With these smooth tires my rolling resistance is greatly reduced. Just watch out for wet and sandy roads! These tires are quality made. No deformities and the center seam is perfectly aligned when properly mounted on a straight wheel. No wobbles, no balancing (uneven rubber distribution) or anything negative that I can say about these tires. I love these tires. They are put on my oldest bike and least expensive but most ridden. Probably log 50-75 miles a week on them..
Can't beat it for the price. I had this on the rear wheel of a single speed MTB - got about 5000 miles before the innards unraveled. Great tire. These tires are good for street riding, the only drawback is that the thickness of the bottom that meets the road. Nice street riding tire. Only downside we've had is flats. I've fixed 2 flats from thorns. One looked like a briar sticker. The tires are fairly thin and light. I run my MTB mainly on the pavement. I once used the Michelin City tire on this bike, and liked it, but had repeated failures-sidewall tears, knots, etc. I never got to naturally wear one out. Also, they were extremely hard to mount. I switched to the Wild Run'R tire, and I really like it. It is easy to mount and the ride is very smooth. It handles and corners well. The only drawback is that I generally have to replace one after about 1700 miles. Still, they are cheap enough that I feel it is totally worth the ride quality and the lack of the hassle associated with the Michelin City tire. I ride a Gary Fischer tarpon mountain bike which come standard with Bontrager knobbies. Two years ago I relocated to Henderson NV and live right next to the Pittman wash no need for Knobbies here. The Michelin tires have literally turned my mountain bike into a incredible road bike. The ride is so smooth and the grip these slicks have are amazing. Lots of concrete and blacktop on this loop a little sand too no problems for these tires. They were also half the price of the road slicks REI carried. I built my own version of a hybrid and I installed these tires for speed.I must say they are pretty fast and so far durable. The traction is fairly good but going fast I don't really care about traction, I calculate for speed during wet and icy conditions so stopping is never a problem. So far I'm very satisfied no issues to report. These tire can't be beat for the price, so far no problems and they are a lot lighter and faster than my previously no brand named tires. They appear to be very sturdy also since I also ride them in the dirt from time to time. They are really built for speed though because I rode in the snow and ice once and traction wasn't all that great. But they weren't made fort that purpose so no complaints. All in all a great tire, I bought two sets. Replaced some Panaracer Urban Max tires with these, after the Panaracers started to to come apart around the bead. I also wanted something a little wider, but still capable of reasonably high pressure. I've had good luck with Michelin MTB tires in general and these are cheap, so I decided to try them. So far, so good. Rolling resistance is decent and I've ridden through some broken glass without any visible damage to the tire. Only have a few hundred miles on them, but they seem to be wearing very little.